Subracks are storage devices designed to be placed as part of a standardised 19-inch rack, and are often used to house electrical equipment. 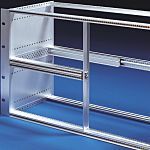 They are used in conjunction with 19-inch racks and can be enhanced using other rack accessories to construct a rack to the desired specification. Subracks are measured using horizontal pitch (HP) for their width, and simple units (U) for their height. What are subracks used for? 19-inch racks are ubiquitous across many industries for storage of electrical equipment. Subracks can be used in applications ranging from the housing of military telecoms equipment, to use in the transport industry, as well as in applications relating to test and measurement. Subracks differ broadly in their dimensions (horizontal pitch, depth and units) and the material they are made from. This depends on what equipment they need to house. The metals used in their construction range from aluminium, to stainless steel, to zinc, according to how strong the subrack needs to be.